Washington keeps its embargo on Cuba because they do not want Americans to see how good is to come here, said US Reverend Thomas Smith in Havana. Reverend Smith, who is part of the 27th Pastors for Peace humanitarian caravan to Cuba, currently visiting here these days said that they came to learn how Cubans have been able to live under the US embargo. One of the aims of the restrictions on Cuba is preventing American citizens from learning about Cuban reality, said the Reverend. 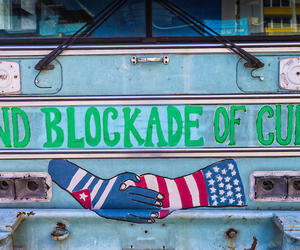 Meanwhile, Pastors for Peace executive director Gail Walker said that although both countries reestablished diplomatic relations the blockade is still there, and they are now involved in educative actions in the U.S. about the impact of the embargo against Cuba. In their tour of many US cities before coming to Cuba, the activists also focus on issues like the Cuba-travel ban and the need to return to Cuba the territory occupied by the US naval base in the eastern Guantanamo province.